There is no fee charged for a guest visiting for the first time. Please present yourself as a guest at the registration table and we will gladly introduce you to the club. Guests are charged a lunch fee of $15 for each visit after their first visit. Speakers Bio: Lion JP Kirksey will adress our Club as newly elected District 2S3 Governor. District Governor J. P. Kirksey was installed at the 95th Annual Convention of Lions Clubs International in Busan, South Korea. Governor J. P. joined the Austin Founder Lions Club in 1972 serving in many capacities in the club, including president in 1979-80. His service with District 2-S3 has included Zone and Region Chairman, District Convention and Mid-Winter Conference Chairman, State Convention Chairman in 1997, and numerous ad hoc projects and committees. 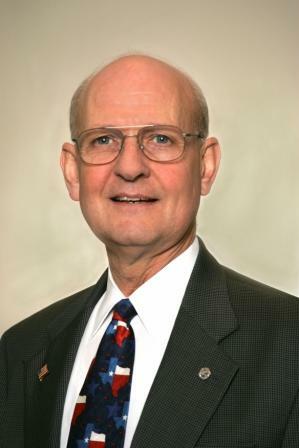 He has received many awards and recognitions for his work in Lionism including the Harry Reasonover Award, two LCI President’s Awards, and Texas Lions Hall of Fame. J.P. is a Life Member and Charter Century Club Member of the Texas Lions Camp, Past President and Charter 20-20 Visionary of the Lone Star Lions Eye Bank, a Melvin Jones Fellow, and a Texas Lions Foundation Fellow. In the community J.P. is Past President of the Austin Human Resource Management Association and Past President and Past Chairman of the Longhorn Alumni Band. He is an active Deacon and long-time Moderator of Manchaca Baptist Church. J.P. graduated from Lake View High School in San Angelo and the University of Texas at Austin with a BBA in Human Resource Management. His professional career was as a Human Resources Director for several companies spanning a career of more than 46 years. He and his wife, Judy, have three children and nine grandchildren. Featured Lunch Menu: Meat and Vegetable dish (TBA), mixed field green salad with assorted rolls and a featured daily dessert. Vegetarian meal or Grilled Chicken Caesar salad are available alternatives as well. We order meals based on your reservations and must pay for them even if you do not show up. Please keep this in mind if your plans shift and cancel your reservation so we can adjust the headcount.